I’ve written variously about the abuse of vulnerable jobseekers by the Department of Work and Pensions via ‘jobseekers’ directions’ issued by Jobcentre Plus – which was then featured by the Guardian and became one of its highest-read articles of the week in which it was published, and rightly so. 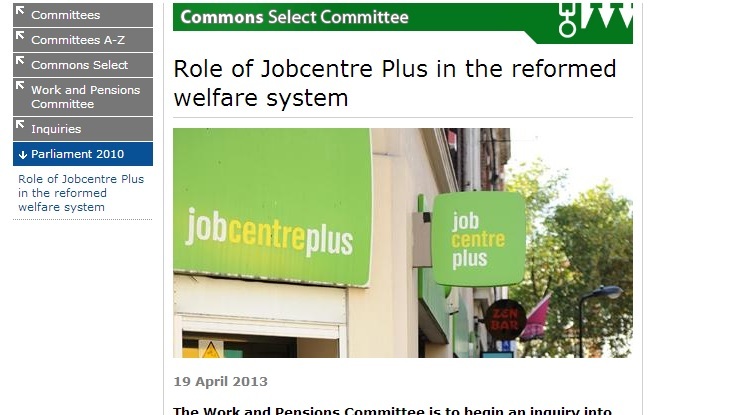 The Commons’ ‘Work and Pensions Committee’ is conducting an examination of the role of Jobcentre Plus, including “the level and appropriateness of JCP’s use of benefit sanctions“. I’ve already made my submission to the committee, sending the links to various pieces of information I’ve published on the matter. If you have relevant information of your own, why not send in your own submission? Instructions on how to do so can be found here. Get writing and let’s get increased attention on the misdeeds of Iain (Duncan) Smith and co. The deadlne for evidence is 24 May so don’t delay. ← What you need to know about Atos assessments. If you fight the dwp over having your benefit sanctioned via peaceful protest they either arrest you or have you locked up in a mental hospital, that happened to me under both labour and the con/dems. Here’s our chance to get some hard evidence into Parliament about the misdeeds of Job Centre Plus employees, working for the Department of Work and Pensions. I have information that will be going in – have you? This is excellent news,skyhawk. I have no direct experience with JCP but know people who have and will be making sure they know they can submit any evidence they have. Lets hope this hearing will expose all the horrors and show beyond doubt how MInisters have lied. Send your information in if you have any! I know people have issues with JCP, but just a word of warning. This looks like part of a plan to firstly criticise JCP, and then privatise it! Do we really want the organisations running the Work Programme to be running a new JCP? If a private company behaved in the same way, I would be complaining about them too. Perhaps they are and if so, I hope people will be putting forward their evidence about the Work Programme providers. Laws are in place to protect everyone. Well drafted policy and guidance for staff as well as claimants should clarify the meaning and intended practical application of the relevant legislation. This is to prevent the misuse of power. I believe from the available evidence that the overuse of Jobseeker Directions and sanctions is the lazy way to get people to comply. It is also in my view an excessive and unreasonable use of coercive power. I hope JCP (the organisation) are not using this excuse to justify their behaviour. You can obtain much better results by treating people in the right way. The whip was devised to force slaves to work and to make them compliant. Yes, the task got done, but at what cost? The best parents rarely if ever need to use sanctions to punish or influence behaviour; instead they inspire, encourage, support and praise their children to achieve their best. The most effective leaders in business and politics use similar skills and techniques to get the most from people. If we want something from others, we must first give. Are JCP fully meeting their side of the bargain, by providing real help and support that meets individual need and motivates people to achieve their best? Jobseekers are now expected to do 1000% more Job search activity, but are they provided with the financial resources to help them achieve this increase? And are they being directed to the most appropriate source of help or are they being forced to things under a threat of a sanction that are inappropriate as per the ‘Maggie’ case? Are the Work Programme providers doing a better job than the JCP? Just read this on Michael Meacher’s blog. The link is to a petition asking for a public enquiry into all the deaths following ATOS/DWP actions. I have started a petition asking for Ianin Duncan Smith to instigate a Public Enquiry into the dubious methods employed by Atos, in the light of the death toll of people recently placed into the Work-Related Activity Group. I feel that something is demonstrably very wrong here, and that the situation needs looking at urgently. I’d be grateful for your support for this petition, and it would be much appreciated if you could share it also. my son had his job seeker allowance stopped for 4 weeks as they say he wasn’t actively seeking work enough, we produced three sheets of jobs that he had applied for from their own site within the last 3 weeks and they still said that wasn’ t enough. they offered a 22 year old man with no academic qualifications a managerial office job and a senior nurses job. A job requiring a full driving liscence even though he has told them he cannot drive. Why are they wasting people’s precious time in this ridiculous way.? This has to be yet another one for the Select Committee to get to grips with. What a shambles. I live on a huge estate near Manchester Airport,my husband although recovering from bowel cancer is actively seeking work,visiting the JCP.They offer nothing,nor help much with finding work.he ideally would like to work at the huge hospital we have a mile form us or else Manchester airport also a mile from us.There is usually work going at the airport at this time of year,but nothing is being offered. His friend who works as a baggage handler has told him this week that 74 Somalians started there a few weeks ago,they can hardly speak any English.As you can imagine,we all know each other on this estate (mostly) so find these things out.He has tried the Agency Blue Arrow for portering work at the hospital and was told he has to have an enhanced CRB.They don’t do it they said,he has to get his own,I know this not to be true as your employer does it,but he has been told this the 3 times he has applied.My 2 daughters work at the hospital and they are saying the new porters are scruffy,dirty articles,the last lot were sacked for selling their walkie talkies worth £1000 each on ebay! How are a group of Somalians working at a major airport,being taken on without this enhanced CRB check,which it would be impossible for them to produce,and is demanded to be able to work there? The same at the hospital ? It is in fact quite scary!!! Manipulation is taking place and the re-write of policy and guidance supports your view. Interestingly, the law regarding JSD’s has not changed, but the way they are currently used most certainly has. This is due to the way policy and guidance has been manipulated. What Should Trigger a Jobseeker’s Direction? 12 Only consider a Jobseeker’s Direction when a customer will not voluntarily undertake a particular action which you think will be beneficial to them and will improve their prospects of finding work. This could be because a customer will not agree to a certain action being included in their Agreement. It may also be appropriate if a customer, while having met the ASE condition, has not taken a particular step which is included in their Agreement, which you think they should do and which they now refuse to do. 13 Make every effort to persuade the customer to undertake a particular action before resorting to using a Direction. Be clear in your own mind that it is appropriate for the customer. If they refuse or are reluctant to undertake the action, discuss with them their reasons. It may be that these are quite justified or perhaps the customer has misunderstood what you want them to do. If, having made sure they are clear about the situation, you still feel that the action is appropriate, emphasise how it will be beneficial to them. Finally, explain that they can be directed to undertake the action and that failure to do so may result in loss of JSA and/or NI credits. 6 Only use a Jobseeker’s Direction as a very last resort. This is after the customer, through the usual advisory interview process, has not been influenced or persuaded to undertake a particular activity which you believe will improve their chances of getting back to work. A) Where a claimant initially refuses to undertake a particular action every effort should be made to persuade them to participate before issuing a Jobseeker Direction. If the claimant refuses, or is reluctant to undertake the action their reasons should be discussed with them to identify any underlying issues or anything that makes it harder for them to look for work. A Jobseekers Direction can be used immediately if the Adviser feels doing so would be beneficial to the claimant. !!!! Some Advisers/offices may interpret this to mean; if the action/step is beneficial they can force a claimant to comply under a threat of a sanction. This could potentially entail most/all customers being coerced into taking a particular action. Others may think it is an easy way to get claimants to comply and it saves them the time and effort influencing the person to agree to the action or following up those Jobseekers who fail to comply. Some may see it as an easy way to achieve those non-existent sanction targets as per the leaked target letter from Walthamstow Jobcentre . Doesn’t sound ridiculous at all to me – This is what is happening. http://www.bufferzone.org and facebook. Will find many case studies legislation and recent media stories regarding service users in Cornwall. If want more information please feel free to contact us. The department of work and pension they been made my life misery and hell for the last five years and they use all kind of tecnique to confuse and disorientated people lives,they send me under false pretences in a menthal hospital where i believe they been damage my sperm when they somministrate me tablet that i no need to take.When they will end all this mess and abuse,i hope soon.